Y NOT THE LAST MAN? When we’ve hit the end of a decade on past lists, I’ve reviewed some of the Post-Apocalyptic media from that era. This time I had enough items I opted to split the decade in half. This covers 2000 to 20004. I’ve probably missed some items here, so chime in if you see a gap. There are some bad films there. No good-bad like Hell Comes to Frogtown, but “we spent good money to make you mutant meh” bad. Still we get the awesome Kairo and about ten minutes of Casshern is awesome. Books: Demons (Shirley2000), Mortal Engines (Reeve, 2001), Idlewild (Sagan, 2001), Night of the Triffids (Clark, 2001), The Peshwar Lancers (Stirling2001), The Years of Rice and Salt (Robinson, 2002), The Butlerian Jihad (2002), Snowfall (2002), Oryx and Crake (Atwood, 2003), Clade (Budz 2003), The City of Ember (Du Prau, 2003), Vampire Earth (Knight, 2003), The Taking (Koontz, 2003), Cloud Atlas (Mitchell, 2004), Fitzpatrick’s War (Judson, 2004), Uglies (Westerfield, 2004). I have a love/hate relationship with Idlewild. It’s intriguing most of the way through but the ending feels a little cheaty. Dragon Head is freaky. Really, really freaky. Didn’t think Wind Waker was post-apocalyptic until someone pointed out that Hyrule has been flooded and devastated. HEY! I have a Patreon campaign supporting these lists. If you like what I'm doing, considercontributing or at least resharing this to spread the word. To keep this list easy to read I’ve tightened the years covered. As we get closer to the present the lists expand and contract weirdly. I include mostly core books, but also significant setting material or sourcebooks. I consolidate “spin-off” and miscellaneous supplements into a single entry. For example at the end you'll see round-up entries with post-apocalyptic elements. Given the number of great things published I haven't included everything I want. I try to list revised editions which significantly change a line or present a milestone. Generally I only include published material- print or electronic. I skip freebie or self-published games. I'm sure I've left something off without adequate reason; feel free to add a comment about a line I missed (if published in 2010). I've arranged these by year and then alphabetically within that year. Apocalypse World is tremendous game. It gets a great deal of love and attention for the mechanics. It created division for its language and commands to the GM. But I’ll leave that for other reviews and comments. How well does Apocalypse World function as a post-apocalyptic game? Because I’ve gone through so many of these games, I instinctively want to put Apocalypse World in a box. Where do I sort it? It has a Mad Max feel, but it’s not treading the same ground as octaNe or Redline. It isn’t the gonzo of Gamma World or Mutant Future, but it does have some strangeness baked in. It isn’t the gunlove of Twilight 2000 or Morrow Project, but it does have violence as a critical element of the play. 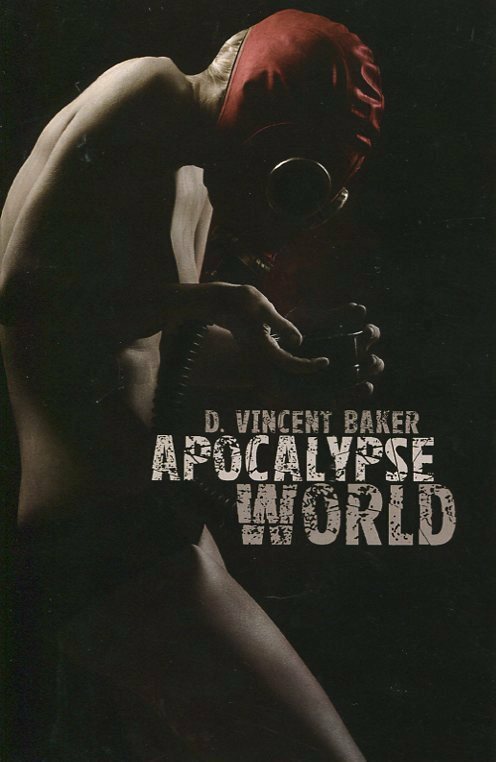 Vincent Baker has said he hadn’t done much with other post-apocalyptic games and I can believe that. It feels like it’s taken themes hinted at in other media (Doomsday, Thunderdome, The Road, Jeremiah) but created something creatively new. Apocalypse World focuses on people. Players pick a playbook for a character type, no duplicates. We’ve seen archetypes and templates in other games, but the physicality of the handout and the immediate uniqueness focuses the experience. And the playbooks say a lot about the background. AW doesn’t spend any time talking about the world, not even to the GM (Master of Ceremonies) here. It knows the players have a vision of these places look like. It doesn’t have to have a history, gazetteer, or even an explanation of how things fell apart. That’s not important. Yet we do get a strongly conveyed world, a sense of what life in this place is like. Again, the playbooks carry this weight. We see the importance of tech and scavenging, not for ancient artifacts but gear for survival. We see that force and violence exist everywhere, but that they have a cost. Most importantly we learn that people are tools and double-edged swords. Relationships and connections bleed into everything. More than anything else the Moves, the things the game structures rules for you to do and do interestingly, show what the plays going to be like. You know this isn’t going to be like other games. When I showed AW to a friend who was preparing a Fallout game he was a little thrown off. I’d only just gotten the book so I hadn’t groked it, but it had “Apocalypse” in the title. Looking back now I can see why. It might have a similar premise, but tonally it goes in another direction. 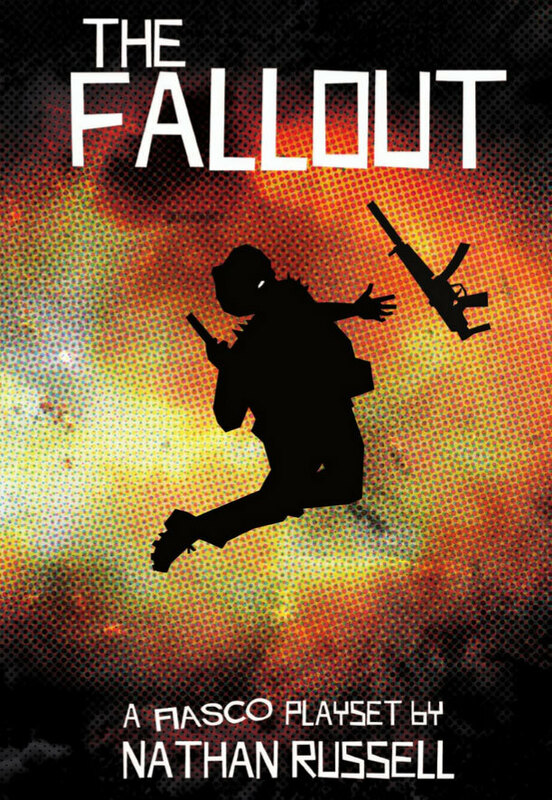 You might be able to bring a Fallout skin to AW, but it wouldn’t be Fallout. That isn’t to say AW doesn’t work with other games. It can, but in particular ways. Sourcebooks for other games can be useful for the GM, helping them build the fluff and giving them apocalyptica to barf forth. And AW can perhaps show you how you might make another PA game more intimate, more human. But that being said, Apocalypse World knows what it wants to do and sticks by it. It has a vision of the world and the play. In other games that might serve as a straight-jacket, but instead that weirdly opens it up. It isn’t for everyone, but it remains a great game and a great resource for anyone seriously engaging with what life would be like in these settings. While Baker hasn’t published any big supplements for the game, you can find a ton of fan-made material on the web. A second edition of AW is currently in playtest. Please, PLEASE tell us what the game's about early in your rulebook. And not in vague terms, like "a game of extraordinary people doing interesting things." As well don't count on your audience reading the game fiction you put at the front. Somewhere in some of the first pages or on the back cover, give us the premise: clearly and directly. It took a lot of hunting to glean that Archetype offered a fantasy post-apocalyptic game. In it, monsters have taken over the world and the only way to battle them is taking on their powers and essence. That's not a bad concept and the game has several things going for it: nice color artwork and a Tarot-based resolution system. On the other hand, the setting’s vague presentation and a 48-item glossary straight out of WW make me nervous. The general mechanics of attributes and skills also owe more than a little to WoD. The game's $15 as a 95 page pdf ($30 for the softcover). That's a little high for me. But if you're intrigued by Tarot-based mechanics or really like slightly unspecified fantasy post-apocalyptic settings you might check it out. I'm always unsure where to put these "Dying Earth" games. They're end of days, and the world fell and changed long ago...but that's so far in the past as to be a forgotten dream. Books like Dancers at the End of Time, Castle Brass, and The Dying Earth have this feeling. We’ve seen a few games on these lists as well. Most have a mythical or dreamlike quality (Low-Life, La Terre Cruese, and maybe Polaris if you read it that way). In any case, Chronicles of Future Earth offers a strange and far future world. 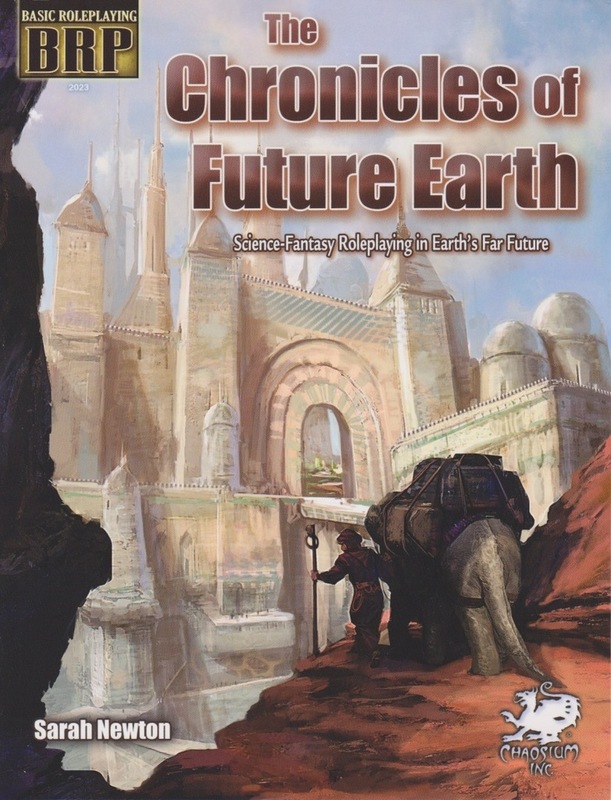 A BRP sourcebook published by Chaosium, on the one hand it feels a like Dark Sun, on the other like Dune. So perhaps that combined with a more serious version of Dying Earth? Or perhaps it’s just a wonderful and weird pastiche. I liked it when I read through it, but at the same time the completeness and detail of the setting threw me off a little. You have a lot of strange and alien races and assumptions to get across to the players. They're well presented, as you'd expect from the ever-excellent Sarah Newton (Mindjammer). She never talks down to the readers and potential GMs. She gores for high-concept and plays it through. That can be intimidating. But it remains a great read. If you like weird sci-fantasy, I recommend this book. This might not seem post-apocalyptic, but I’ll keep claiming it is. It just feels that way to me. The English Civil War ends with the death of Charles I...or it would end but that murder instead breaks the Divine Right of Kings and shatters something in the world. The conflict continues between the alchemically backed Royalists and the Clockwork Roundheads. But order has broken down, and society has been splintered. Different factions and faiths wander and struggle for the souls of the world. There's a sense of isolation, with villages left alone and waiting for the rest of the end times to come. Think post-apocalyptic by way of A Field in England. Clockwork & Chivalry doesn't have to be played post-apocalyptic. You could do a conventional military game. But I love the idea of the old world ending, and an uncertainty about what comes next. If you like historical games, I recommend checking this out. You can see my comments on the 1st edition core and the Divers and Sundry sourebook. 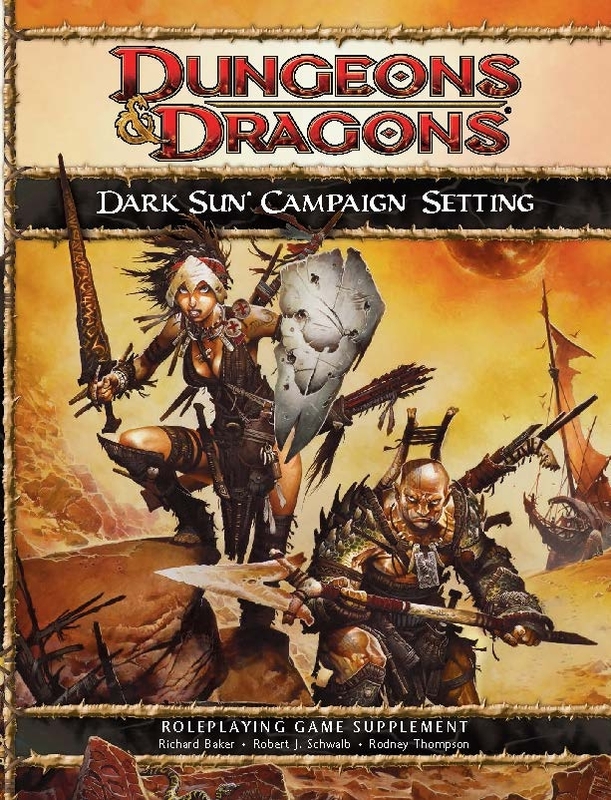 At first choosing Dark Sun as a core D&D 4e setting puzzled me. But in retrospect it makes sense. Dark Sun stands out from any other world and has a clear and direct path of play. Birthright's more niche, Al-Quadim is more echoing than original, and Mystara's close to Forgotten Realms. Still…why no Planescape or Spelljammer? 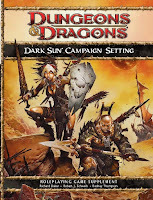 Dark Sun offers a fantasy setting of dead gods and polluting magic. It once had a distinct and striking look in the TSR days, with Brom’s artwork the cornerstone. The 4e version loses that look and so it blends in with the rest of the line. 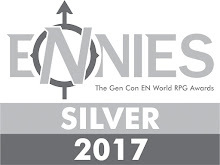 WotC decently supported this setting with a creature book, several modules, and many electronic adventures for organized play. A lot of people love this Dark Sun, though some object to the truly weird stuff in the later TSR edition. I'll be curious if WotC returns to this well with 5e or decide it has run dry. A short, systemless setting by Brad Murray (Hollowpoint, Diaspora). It has rained for a hundred years. Our world crumbled as the water levels rose, the ice caps melted, and temperatures slowly climbed. The book suggests that any game played be set in your hometown, combining these ideas with your personal experience. 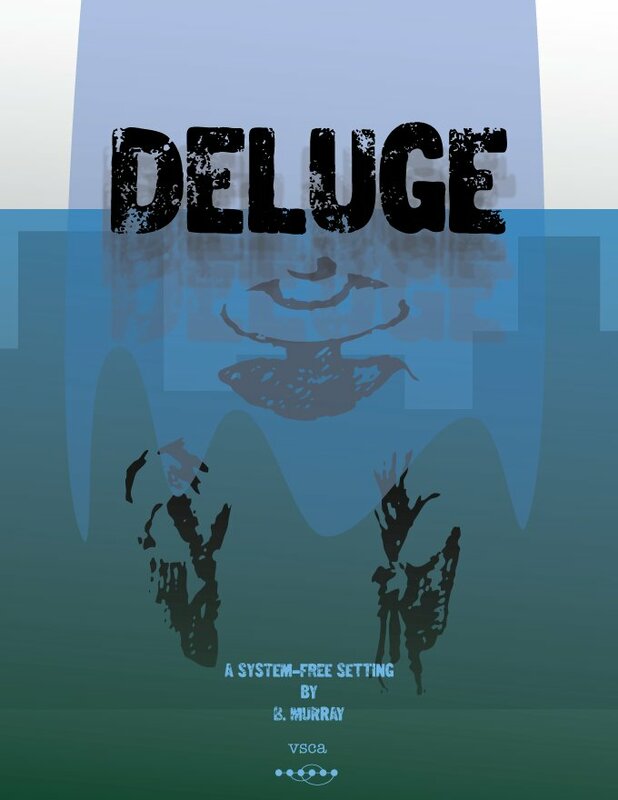 Deluge provides systemless information, like typical character archetypes, but then talks about what to consider when adapting that to a game. It's a great approach which other universal supplements could benefit from. The game includes randomized tools for building the world, ideas on challenges & opposition, and suggestions for what to do in this world. 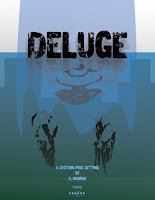 Deluge is a smart, short (34 text pages), and useful supplement. It’s great as a setting, inspiration for similar apocalypses, and model for how to present information. It is currently available PWYW on RPGNow. A cute, light indie rpg. A Kickstarter version superseded the original in 2012, offering graphical improvements. It dresses up the original game and made it more presentable without bloating the book. 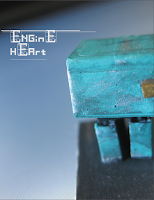 In Engine Heart humanity has died. But it has left behind many robots. But unlike many robopocalypses, in the aftermath you play tiny and unobtrusive service robots. There's a simple resolution system with characters built on a set of skills connected to three tracks (Intelligence, Chassis, Crux). A few figured stats complement these. Character also pick some additional features (arc welder, solar powered) and defects (high maintenance, overheating). The game weirdly gives little direction of the GM (or Programmer) as to what play looks like and what characters should be doing. There's a page or two, plus an example of play, but that's it. Engine Heart is currently free on RPGNow, so if you're at all intrigued you should check it out. 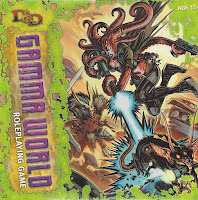 aka Gamma World 7th edition aka Gamma World 4e. This edition offers the most radical reworking of the original game by far. Rather than a distant or near future nuclear apocalypse, it posits a reality warping effect. Though...looking around at the various publisher blurbs and reviews from the time, you might not realize that. Instead these focus on mechanics and presentation. It's a little odd. Though I knew GW7/4e had changed the background, I had to hunt around for a long time to find a good synopsis. Essentially a Swiss Supercollider crashes together many possible realities into one. I like the idea, because anything can happen...BUT. This Gamma World comes in a big box, looking much like a starter set. In some ways it is. It uses a digest sized book and has lots of flashy bits (maps, tokens, and cards). It builds on D&D 4th edition, offering a particular feel and a focus on balanced combat and builds. GW sticks close but makes a few changes. WotC notably shut off the possibility of third parties making new items for GW. I don't know if that helped or hindered the game. I do know that I skipped on it because of the cards. The main box includes two sets of cards covering general mutations and one shot mutant abilities. There's the idea that the continuing reality warping means anyone could change at any time. That's great and I love card-based support materials. But WotC opted to release more cards in random booster packs. Nope. I'd seen that before and it never turned out well. Most gamers I knew who picked this up skipped the additional cards. And most really liked what they saw of the game. WotC supported GW modestly, but it felt like they didn't know what to do with the line. I suspect the middling success of this means we won't see a version based on D&D 5e, at least not from WotC itself. You can find copies of this out in the wild. If you're curious about the Gamma World, there are few better places that Critical Hit's assembled resources on it. Reviews, character sheets, new tools. That's a great place to start. A Belgian rpg set in a near-future devastated by pollution. The title comes from the Latin for Free Will. Humanity has retrated to megaplexes and supernatural forces rule the outside world. It has a dark feeling to it, perhaps close to something like Armageddon from Eden? The reviews suggest it has serious problems with layout and presentation. It seems to be an amateur publication, but one with an ISBN and physical copy. It uses a resource-spend mechanic for resolution, not one of my favorites. News has gone around that with the new Chaosium reorganization, they will discontinue their "Monograph" series. These fan-made, sometimes lightly edited, projects for CoC and BRP ranged widely in quality. Some could be great, but others missed the mark. There's a world of difference between Rubble & Ruin and the already mentioned Chronicles of Future Earth, and in more than theme. I'd hoped for a generic toolkit for BRP Post-Apocalyptic campaigns. But R&R has a specific, near future setting it wants to play out. It clearly comes from elements developed for an ongoing house campaign. It has the feel of a '70's PA game, but less gonzo. Like Gamma World dialed down several degrees. The near-future nature means that the setting can't really go too crazy. A little over half of the book's devoted to system mechanics and new BRP rules (cyber enhancements, gangs, prospecting, etc). As I understand it the rapidly evolving nature of "core" BRP means that some of these don't fit with what later became canon. If you like BRP (in the Chaosium, Legendary, RQ6 or other flavors) then you might find this a useful product. 12. 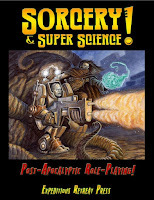 Sorcery & Super Science! I'm struck by how many love letters to early gonzo we've seen on these lists. 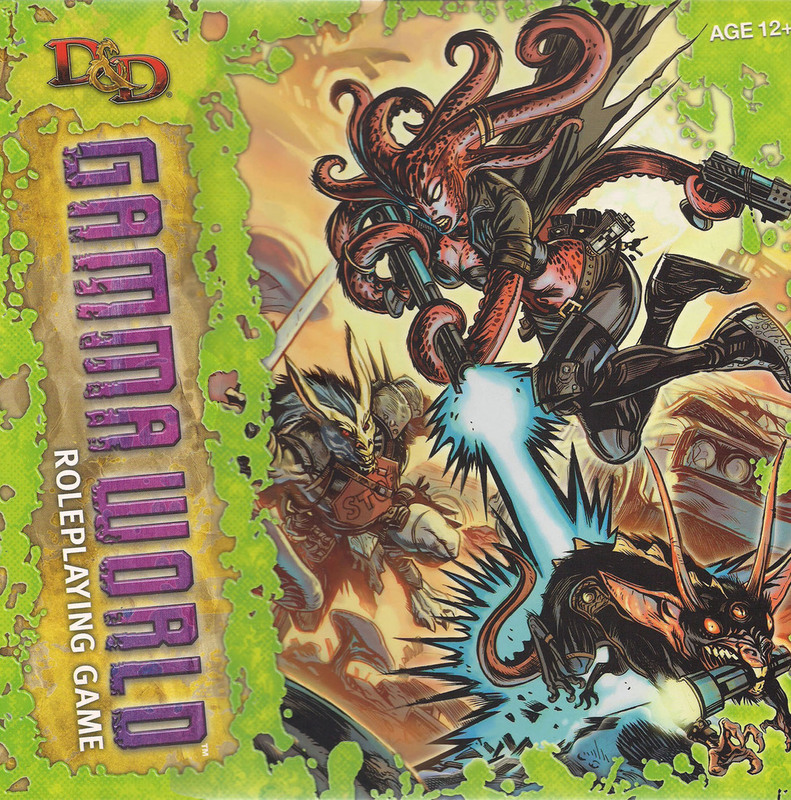 Games breathing in and out the weird of the earliest editions of Gamma World. Or at least the GW before they shook it up to make the world coherent. I didn't see throwbacks like that on the Horror or Steampunk lists. The closest would be games aping the style and presentation of White White books, Nosferatuclones. In Supers we saw some games hearkening back to the central mechanic of older games (FASERIP and its many offspring). But games like S&SS fall pretty close to the Gamma World tree...before running off on spindly, mutated legs. 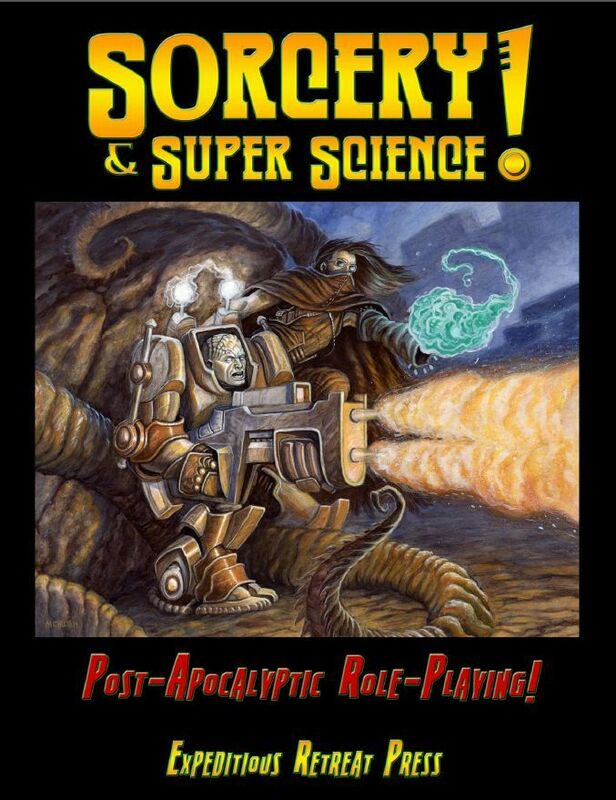 Sorcery & Super Science takes place several hundred years in the future. In the early 22nd Century an explosion of the weird began the break down the old laws of nature and humanity. Eventually conflicts shattered the moon and brought devastation across the world. Survivors formed enclaves and new peoples appeared, including mutants of all kinds. The game focuses on the classic explore, exploit, and exterminate formula. But it does that with a good mix of humor and clever concepts. It has gonzo, but it rarely points at it. Instead it plays the straight man. So the when the picture of a mutant cactus cowboy shows up, we don’t dwell on it. The art reminds me of classic Gamma World and After the Bomb, though the quality never rises to that level. S&SS has a class system, called "catalysts" and a new resolution mechanic. This "floating dice system" seems a little clunky when I read it; I'd have to actually see it in play. Is it good? I've enjoyed what I've read of it. I recommend checking out the 48-page quick start, The House of Blue Men. The smart and careful Johann Four has a lengthy review worth reading. He likes it, though sees some weakness in the presentation. However Intelligent Cactus Gunfighter in a Duster invalidates that. 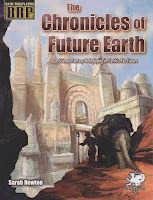 Expeditious Retreat Press has supported the game with many pdf supplements on lost items and new creature. They're short, but might be useful for GMs running these kinds of games. Against the Dead tries to stand out as a ZRPG by using popular system, in this case d20 Modern. However, Against the Dead does comes to that a little after that system's run its course. The publisher material suggests that it aims for a fast version of those rules. One interesting concept is that the zombie campaign arc breaks into three eras: Emergence, Ascendance, and Apocalypse. The goals and available mechanics vary between those. Also, though the cover and company blurbs suggest a conventional and realistic survival, apparently you can also play magic users in Against the Dead. That’s a significant split from the game's general presentation. Outbreak: Undead positions itself as both an rpg and a survival guide. That at least makes it stand out from the crowd. However usually I'm looking for game-able material. OBUD It has a number of flaws which make it not the kind of game I like. I'm not fond of systems which have you make a character based on yourself. I know exactly how long I'll survive in that environment. The layout and graphic design- done as survivor notebooks- feels forced. It is also irritating to read. Others may embrace the verisimilitude of this approach. War of the Dead offers a series of chronological zombie survival scenarios, tracing the outbreak and collapse of civilization. 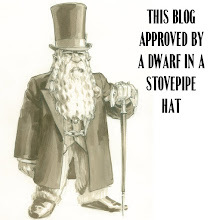 It uses Savage Worlds, but could be easily adapted to other ZRPG systems. Three collections bring together the individual weeks together into a three act structure (so far). Z-Corps is a French ZRPG set primarily in America. That's a little funny to me, but says something about the thematic connection between the zombies and a decayed US. Maybe? Or perhaps Redneck zombies just seems more cool than whatever the French equivalent would be. 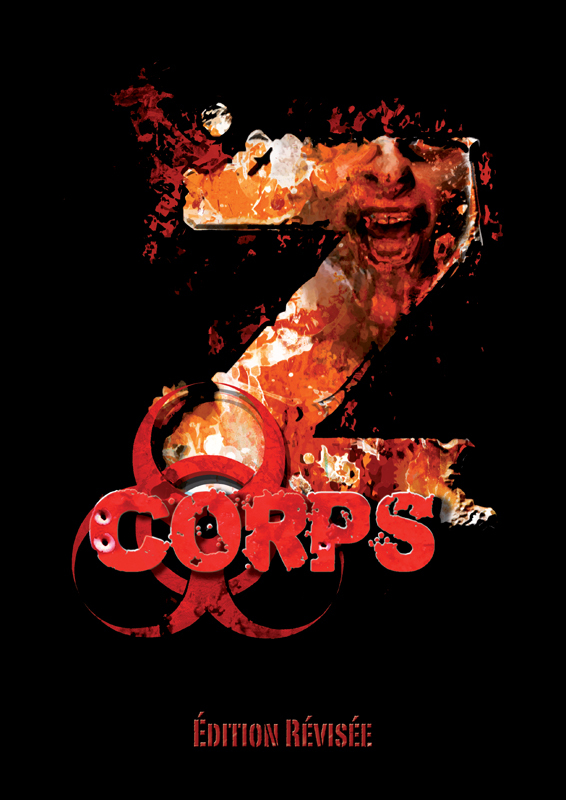 Z-Corps uses the D6 system, which may dig for the ease of play. It appears to still be in print and have several supplements (including Denver and Savannah sourcebooks). This year offers an odd mix of games that fall at the margins for various reasons. Some games dip their toes into the field. Many of the Game Chef designs for 2010 have a post-apocalyptic theme. OOH The Fallout is a post-apocalyptic playset for Fiasco. As it says, "Mutants, motorcycle gangs and Rami’s Rat Kabobs." 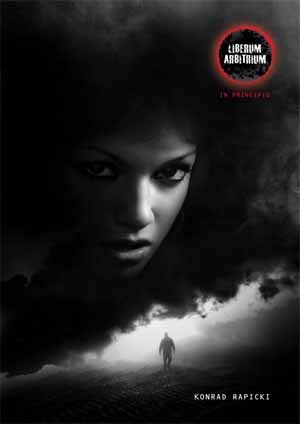 Mirrors is a sourcebook for World of Darkness offering several new campaign frames. "The World of Darkness Destroyed" shows how to run the various supernaturals in the wake of a global apocalypse. It isn't Monte Cook's World of Darkness, which has a strong and clear focus. Instead its a tooolkit for running these kinds of games. Some corner case games have minimal information available. Neuhanse is a Finnish rpg done as a public beta. Set in the Baltic Sea in 2070 following an apocalypse, the game doesn't seem to have been taken any further. 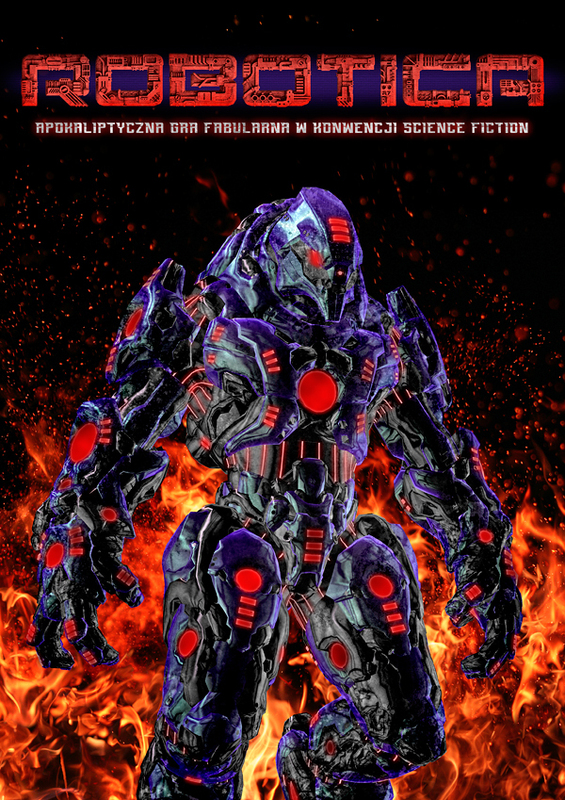 COLLAPSE is a pdf-only self-published PA game. It looks like near future maybe? Two others are interesting but lie right on the edge. More disaster than PA, Abandon All Hope, seems a little like Metamorposis Alpha, set in the immediate aftermath. are aboard a massive penitentiary spacehulk. However, something has gone terribly wrong- and an encounter with a dimensional rift has let "things" into our reality and...ok, let's just cut to the chase- they take Event Horizon premise, marry it to Pandorum and stick aboard a prison ship. Dance of the Damned is card-based game, using a standard playing deck. This storytelling GM-less game sets up a basic situation and offers rules to allowing players to adjudicate and develop the narrative. Here the set-up echoes The Masque of Red Death or the frame of the Decameron. The characters have taken refuge in a castle to escape a plague ravaging the countryside. There's a competitive element to the game as players pass cards onto one another. Suits allow for different results and twists.